An entangled juvenile whale shark reported on the backside of Molokini, off of Maui’s south shore, was spotted Thursday for the second time last week, state Department of Land and Natural Resources officials reported Saturday morning. Witnesses saw the whale shark ensnared by heavy gauge line wrapped around its midsection, officials said. Initial reports put the whale shark last week Sunday off of Olowalu and on Thursday several commercial snorkel and whale tour companies reported the shark near Molokini. 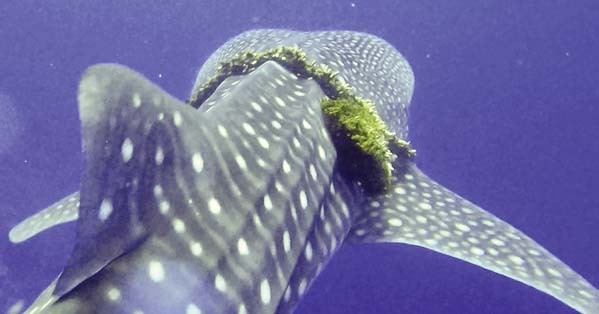 ProDivers provided photos that showed the entanglement as a tight wrap around the whale shark’s body, forward of its pectoral fins, officials said. “The wrap is cutting into the animal, which is somewhat emaciated,” officials reported. Fisheries experts believe the entanglement to be life threatening. Whale sharks are listed as endangered worldwide, with an estimated decline of more than 50 percent since 1975. Like many marine animals, they are at risk to threats like entanglement. Officials asked anyone who sees the entangled whale to report its location by calling (888) 256-9840. If conditions and resources allow, responders trained in disentangling large whales may attempt to remove the gear, officials said, adding that the responders are with the National Oceanic and Atmospheric Administration’s Marine Mammal Health and Stranding Response Program. “While obviously not a whale, if the whale shark was to remain at or near the surface, the team would attempt to use a hooked knife deployed from a long pole (and from a boat) to cut the wrap of line entangling the animal,” officials said.